Hey, hey, hey!!! JT’s getting controversial. I’d even go as far as to say feisty. Not really, just something that came to mind after I tripped over my tripod the other day, took evasive action to avoid knocking the whole rig flying, and narrowly missed face planting in the prop shelving. Welcome back to my blog. Have you noticed how the photography world is full of do’s and don’ts? It is, as is in most industries, but we can only give our opinion based on the experiences we have. In fact one of the first things I read, with eager anticipation, after getting many blurry shots. If you want sharp photographs you must use a tripod… Yes, that’s definitely one way but not the only way. Let’s not beat around the bush any longer and get straight to the meat. 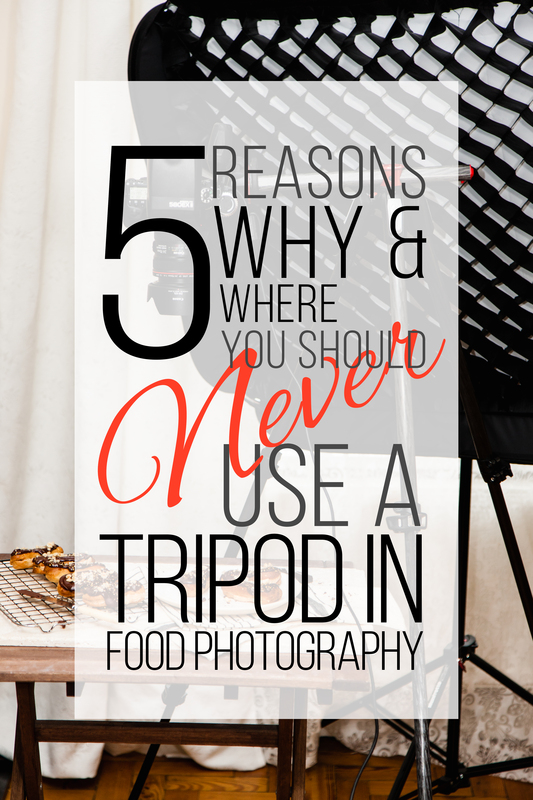 Here are my 5 reasons why and where you should never, use a tripod for food photography. 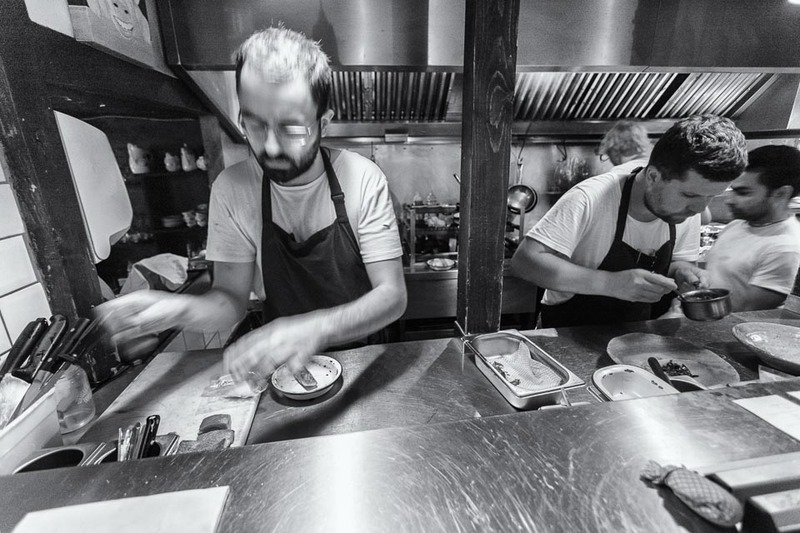 You’re invited to shoot your very first restaurant at a really cool London bistro. You turn up, a bit hot from the train journey, after carrying your heavy camera bag. The nerves are jangling and your mind is racing as you walk in, searching for where you hope to be shooting, looking for ideas. You’re now set up and shooting at the main point of customer traffic. Everyone who comes or goes is going to pass you. At this point, you realise all your space will be taken up tethering to your laptop. Let’s get out the tripod. Ha!! Yeah right. Everyone coming in and out could potentially be tripping over the legs, possibly hurting themselves, ruining the pictures and upsetting the owner and his staff. Sometimes there just isn’t room for a tripod. Nobody wants you to be in the way and who wants to be remembered as a pain in the proverbial. The chef is hoping for you to come out with quite a few choices for him and his marketing team to use. He’s not just thinking about the website and social media, he’s wanting to get reviewed and have amazing write-ups in top foodie publications. They’ll need awesome photos for that. He takes a look and smiles big. “Yeah, I like these. Can we get a few different angles?” “Absolutely,” you say. You take a look at your settings. You’re at 1/30 shutter speed because although the light is nice, it’s pretty overcast and dull today. You want to keep your ISO low to keep the files clear of noise and hold onto all the colours. You start setting up your tripod to do some top-down shots. As you’re doing this the next dish arrives. Now you begin to feel the pressure. I believe you should have as little effect on business as possible while you’re shooting. In the case of restaurants, they can push out food pretty darn quickly, even fine dining restaurants. In the most part, being locked onto a tripod can really restrict the shots you take and are able to capture in a timely fashion. You want to make the most of this stunning food and all the effort and opportunity you’ve been given. Get as many different shots as you can. It’ll give you and your client so many more choices. Also, keep in mind. When you’re working in a high energy environment you should match that energy and pace as much as you can. It’ll help you feel the real vibe of the business and this will make the creative process much more compatible. There’s a break in the flow of beautiful food coming from the kitchen. The restaurant is getting busy and there’s a buzz and tingling in the air as more people sit down to lunch. The chef lets you know we’re going to hold off on the photos while the kitchen gets on with the lunch rush. Seems like an awesome opportunity to get some action shots of the chefs at the pass. You notice how much darker it is back here, away from the windows. Once again you’re not keen on pushing up the ISO too much, you’ve got your f4 lens wide open and the shutter speeds are needing to drop. You could get some cool motion blur of the chefs, but all over motion blur really isn’t that cool. Hand holding your camera at low shutter speeds is always going to be a challenge. You won’t get amazing or even good at it if your camera stays on the tripod plate. If you’d never use a tripod there would have been tons of practising keeping the camera still. I’ll pop a post together about things to think about to keep your camera still when a tripod isn’t an option. The excitement and energy of the bustling bistro is contagious. You want to make the most of this. So you say, screw it, and start to crank up your ISO. You rattle off a few shots and take a look at the LCD. Wow!, they actually look pretty good up at ISO 1600. Sure they do, you’ve spent a good chunk of cash on this baby. It’s designed to be pushed way further than you have to this point. You check the lens to make sure everything is set right. Then you notice the IS (Image Stabiliser) button is off because that’s what you do when it’s on the tripod. No need for stabilising there. You switch it on and take a few more shots. Now you’re getting image blur of the chefs but, by and large, the background is in focus. How bloomin amazing do you feel now? If you always shoot on your tripod you don’t need IS or high ISO capability. But all this cool stuff comes as part of your amazing new camera gear and is supposed to help you create great shots. Whatever kit you use, I advocate using as much of its functionality as possible. You’re buzzing at this point. Really getting to grips with your gear and the restaurant environment. So when the lunch rush dies down a little, the chef tells you they’re going to continue sending you dishes to shoot. Now you’re up for anything. The tripod is put to one side and you realise you can get amazing shots without it. The first of the desserts arrive, the fireworks of any meal. 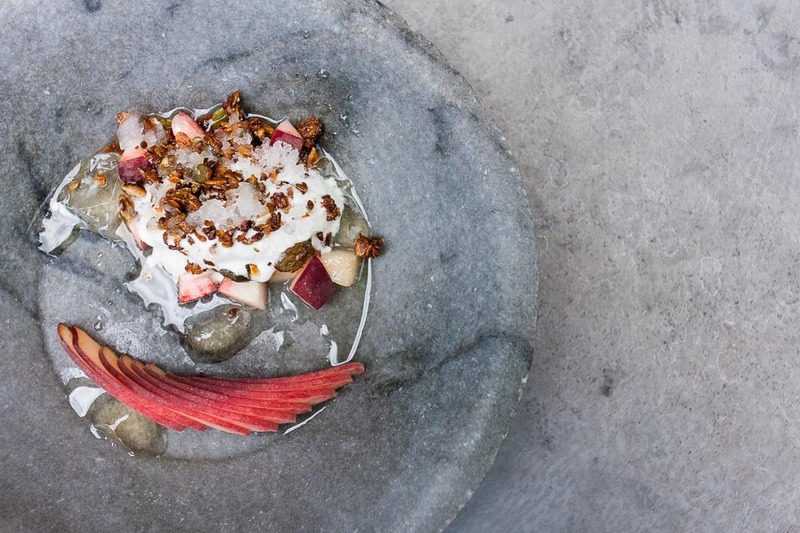 Putting the camera to your eye you begin to move, fluidly around the dish, taking different crops, moving in tight, almost dancing around the plate. You grab a couple of the other dishes you’ve already shot. Looking at new ways to shoot them. You’re engaged, focused and in the zone. It’s amazing! Getting your body involved in the shoot is one of the most important things to me. The action and physical engagement make a huge difference. I’ve written about this before in Using Your Body In Food Photography. Somehow the tripod stands in-between me and the subject, at least that’s what I find. I need to get in there, dance a little, sneak in close and then take a look from a distance. It connects me to the food or whatever the subject. I’m sure I will have ruffled a few feathers with this post. It’s really about taking a look at a different approach at how we all work. I’ve often learnt a great deal from situations which haven’t been ideal, pushing me out of my comfort zone. So I encourage you to try some different techniques when you’re not working for a client, practice techniques you see others using. Then when the time comes where your comfort zone is tested, you’ll have a bunch of extra tools in the bag. If you’re an avid tripod user you may be saying, what about this and what about that? Take a deep breath, a good tripod is awesome I think every photographer should have one. I’ll be back with more on tripods and where I use them in another post. Stay tuned and I appreciate each and every one of you. See you back here very soon. So true! Anyone who has shared the buzz of shooting in a hot and busy kitchen at the height of service will know that hand held is the only way to go. When it actually comes to shooting dishes I think that the jury is still out and there is a case for both approaches, finally when it comes to restaurant interiors a tripod is nearly always a must in my opinion. What your article does though is get us to challenge our routine ways of working and that has to be good! Thanks for your comment and I’m glad you got the point of the post. Totally agree on the interiors, although there have been times it wasn’t possible or practical to use a tripod. That’s when all the practice outside of our usual routine comes in to save our skins. The jury will always be out on many subjects in the creative realms, I just like to mix things up a bit and get us all thinking. Well, I am not a big fan of tripod, but I don’t do food photography! But I really like to eat . You have some great points, and I do understand exactly what you mean, as in many cases, I rather do to the location and shoot! The tripod sometimes might be intimidating and might be in someone’s way. Not to mention a bit more time consuming. So shooting at high iso, not a problem at all! Some love their tripods, others never touch them. I’m always pushing my work routine to shake it up a bit. That’s the real point of this article. Not to get stuck in ways other people think it should be. Do what you want to do, especially if it breaks the rules. Otherwise how will we know what we can do if we don’t step out of the comfort zone. Thanks for reading, I really appreciate your following. These are great points! I’m a tripod user, always, as I have a HUGE camera and am a small person. I just can’t hold it still enough! I don’t shoot in restaurants as a rule as I’m still a wannabe, not a professional. I’m going to have a go sans tripod, and see if I can get anything at all useable. Thanks for making me think differently 🙂 No feathers ruffled here. It’s always good to try new techniques, learn new skills. Better to do it in your comfortable environment than with a client. Sometimes I love my tripod, other times I feel like I wrestle with it. Some restaurant shoot will allow for a full set up to shoot, others want you off to the side with minimal kit. Image stabilisation will certainly help with hand holding. The new gear out there can give you almost a full stop of shutter speed flexibility. Happy shooting and thanks again for joining me here.